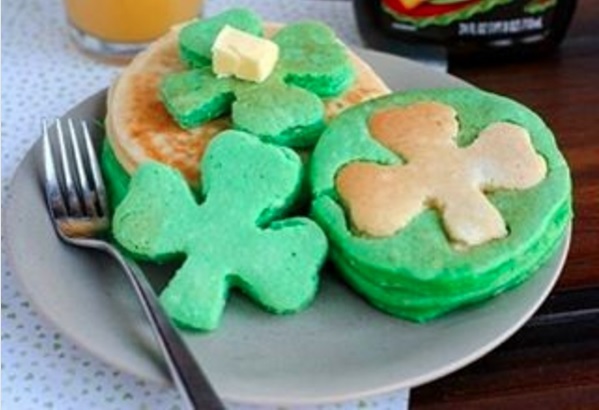 I may not be Irish, but sure, I’ll take some luck and a smooch. By Saturday, Christmas finally came and after a quick glance at the menu, stitches still intact, I ordered the food item that I had been hearing about for weeks. 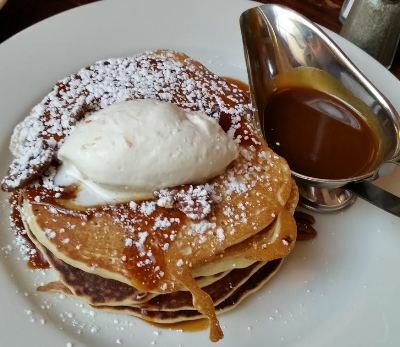 The Salted Caramel Pancakes from The Smith were everything I had imagined, and more. 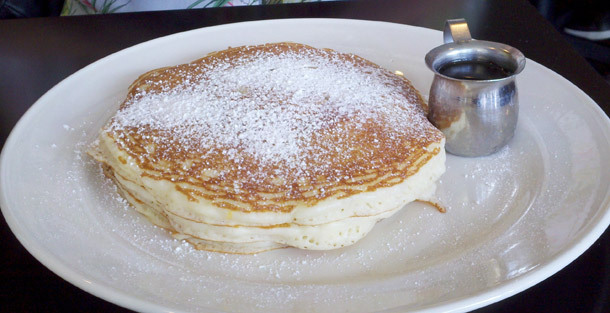 The pancakes themselves were like heavenly pillows; if I could have placed those in my mouth after surgery, instead of the gauze, the recovery process would have been much more sweet and savory. 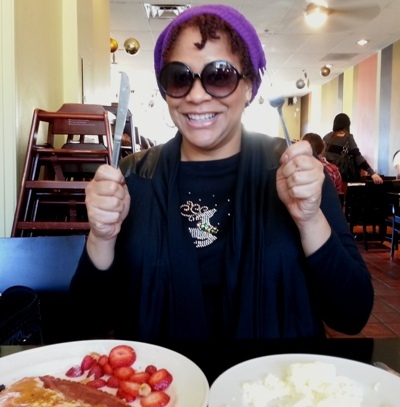 The pancakes were so fluffy and delightful that I actually smiled (to the best of my ability) while eating. 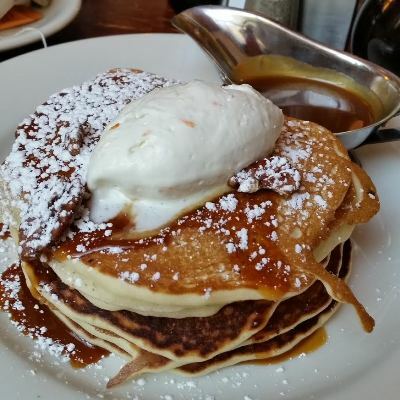 The touch of salted caramel to the already delectable delicacies created a pancake party in my healing mouth. This weekend I was very fortunate to have Co-Founder of Tinder Jonathan Badeen join me as a Guest Reviewer for Ma’amCakes! 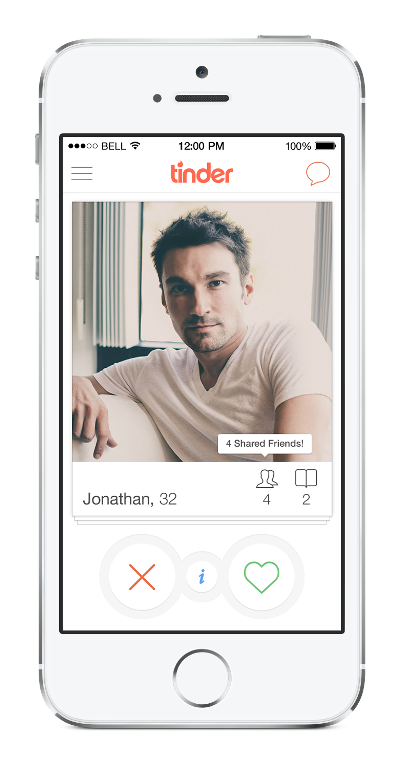 Tinder, created in 2012 by Jonathan, Justin Mateen and Sean Rad, is a popular dating app that facilitates communication between mutually interested users. The app encourages users to either swipe right (or press the heart) if you’re interested, or swipe left (or press the “x”) if you’re uninterested; the only way you can message a user is if you are both a mutual match. 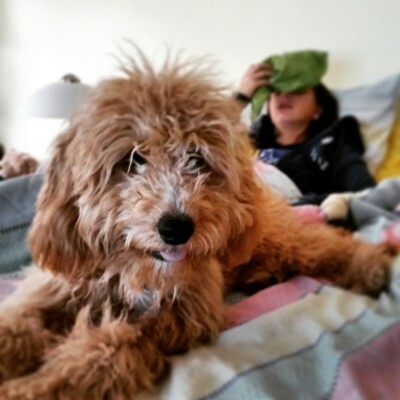 While this feature is beneficial to prevent communication with any crazies, one of the best components of the app is that it requires a Facebook account in order for you to register. Although Tinder has received some complaints about this, Jonathan informed me that the Facebook requirement was actually created to make its female users feel somewhat safer about using the app (i.e. perhaps you might be more inclined to meet a dude when you see that you have four Facebook friends in common). On that note, I should mention that I actually met Jonathan because… we matched! Although Tinder was originally popular with students between the ages of 18-23, the demographic is slowly shifting to upper 20s-early 30s. In fact, because of these original demo statistics, the speculation began that the app was meant for just “hooking up.” Yes folks, the idea that Tinder is meant to be a straight version of Grindr is just a RUMOR! Jonathan mentioned that because college students have a (somewhat) easier time meeting their relationship candidates, students typically use Tinder strictly for hooking up, thus the rumor began. Like I suspected, Tinder can be meant for everything: finding new friends, relationships, or even a special someone you can share pancakes with. So there you have it people; calm down in those initial messages, and maybe keep it in your pants a little longer! By definition, Tinder is “dry, flammable material, such as wood or paper, used for lighting a fire,” hence the origin of its name. 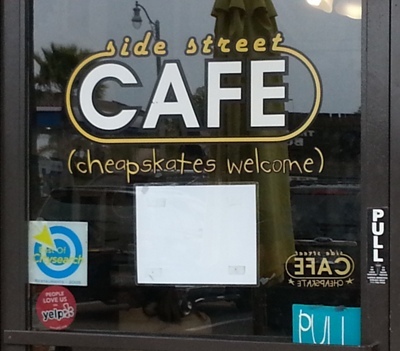 As a result, when choosing a spot for this pancake review, I thought we’d keep it thematic, and visit 3rd St. hotspot Toast! 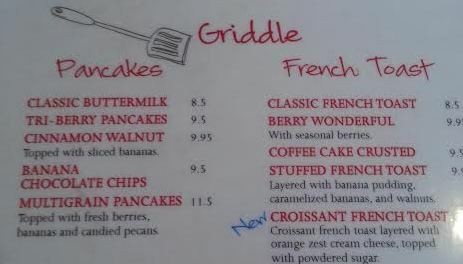 These pancakes were delicious, and considering they were filled with chocolate chips, they actually tasted rather lite. I will admit I did use syrup (which, as you can recall, Ma’amCakes’ motto is that a truly delicious pancake doesn’t need syrup) BUT, what can I say, I like chocolate chip pancakes with syrup! It’s my go-to. 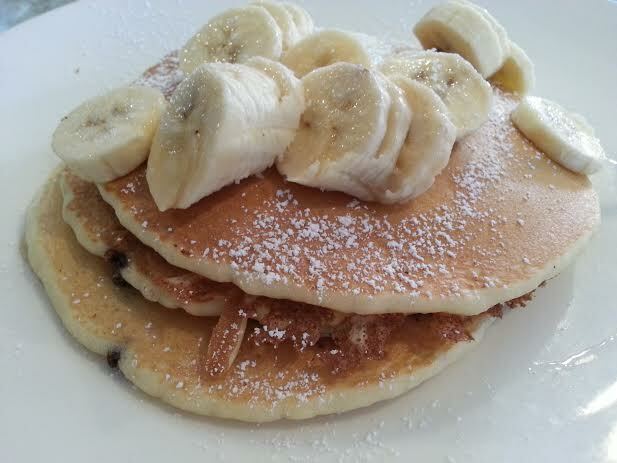 The cherry on the cake of this pancake were the bananas on top. De-lish! 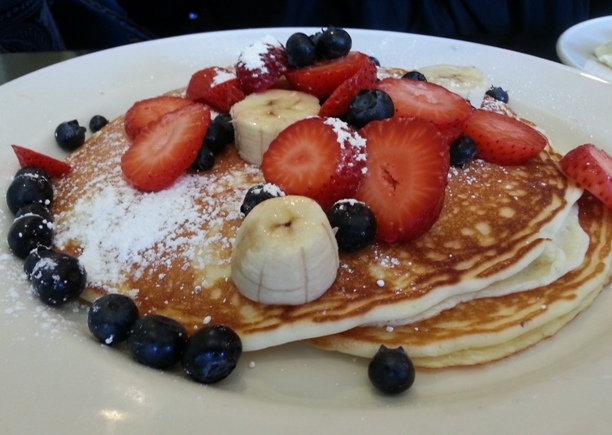 “These are definitely healthier pancakes,” said Jonathan, “they don’t feel too heavy.” Jonathan needed some syrup on his pancakes as “the fruit is a little tart,” but he otherwise enjoyed the meal. “I really liked the candied pecans- I’ve never had pecans in pancakes before.” I guess when you’re developing a super popular app, you don’t have time to get out much! 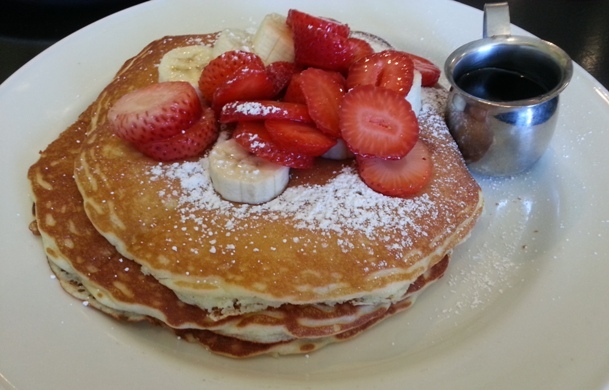 “These definitely don’t feel gluttonous, so I won’t feel bad after.” Agreed – in fact, that’s the best part about (well-made) Multigrain Pancakes! Thank you so much Jonathan, for being a part of Sunday brunch with Ma’amCakes! 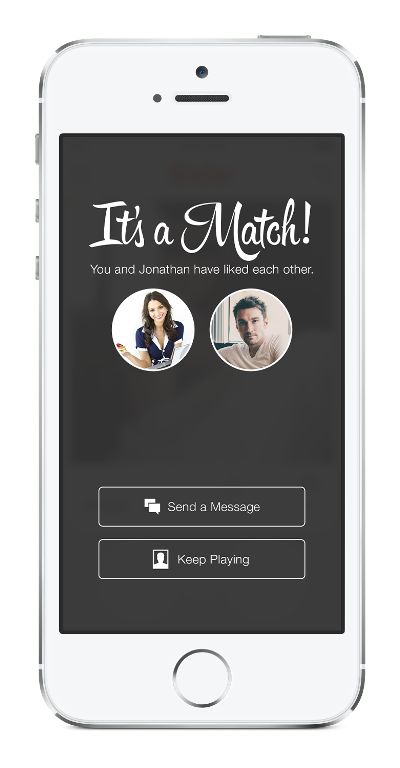 When I suggested there be a “back button” feature to the app, Jonathan said Tinder is working on it, and that while he is sworn to secrecy, we should “stay tuned for exciting new features that will allow you to engage with your matches to a new level!” Swipe right. 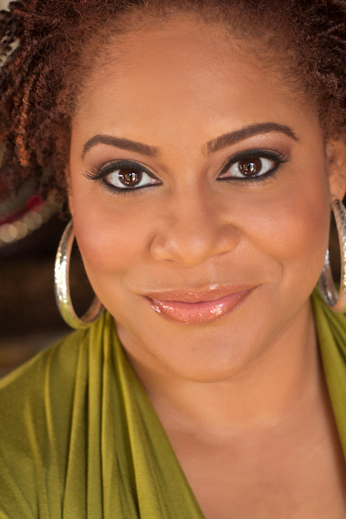 Right before the holidays, I was incredibly honored to have Comedian and Actress Kim Coles join me as a Guest Reviewer for Ma’amCakes! 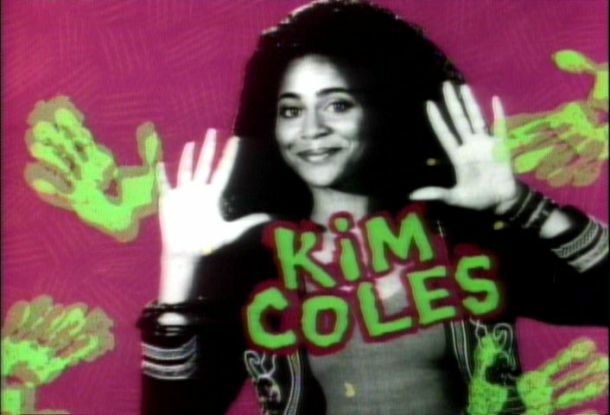 Kim, best known for her work on In Living Color, and Living Single, has also appeared on many television shows including Frasier, Six Feet Under, Celebrity Fit Club, and The View. Although I typically don’t mention how I meet my Guest Reviewers, Kim and I have a rather cosmic connection, as I actually met her on a night that I lost my job. That evening, I happened to be partaking in part-time promotional work for one of the studios, and my assignment was at The Comedy Union on Pico Boulevard in Los Angeles, CA. Kim, who was performing that night, along with the owner, took me under their wings, fed me drinks, and helped me figure out a plan of action. Of all the nights to lose your job, but still have to work an additional gig, I couldn’t have asked to be around more caring, positive, and hilarious people. For that, she should maybe consider changing her name to Kim Cools. And finally, as I’ve locked myself in my apartment to write this review on a Saturday night (that makes me a serious writer, by the way), low and behold I discovered that today is Kim’s birthday. Coincidence? I think not! Upon choosing a restaurant for our review, Kim informed me she was eating gluten-free, so I took her to… any guesses?? Bea Bea’s! 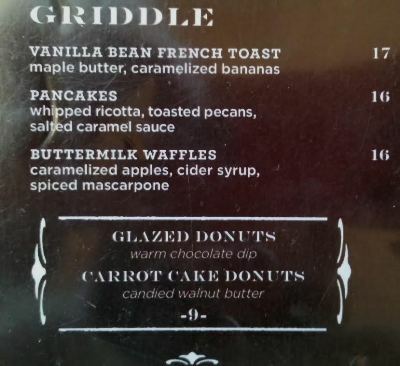 Not only do they have some of the best pancakes in Los Angeles, but they have the largest amount of gluten-free breakfast options I’ve ever seen; I mean, check out this extensive menu! 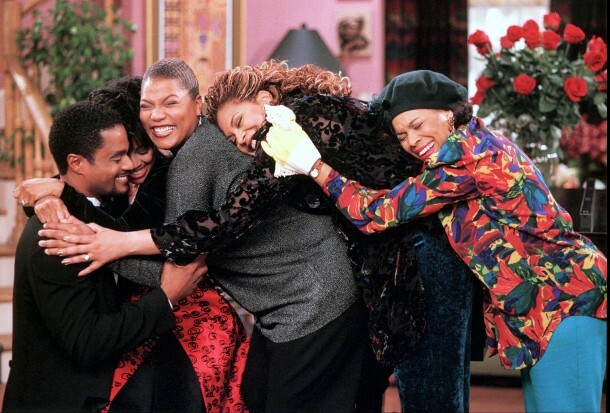 Kim mentioned she had many fond memories in that part of Burbank, as Living Single was shot down the street at Warner Brothers. 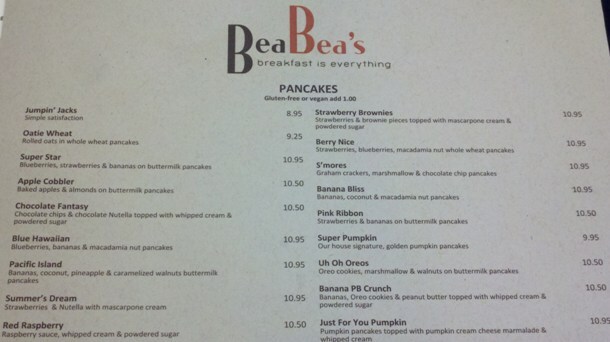 When repeating restaurant locations for a review, I typically try to order pancakes I’ve yet to experience from the menu, and Bea Bea’s is no exception. So, during this outing, I went with the Pink Ribbon. 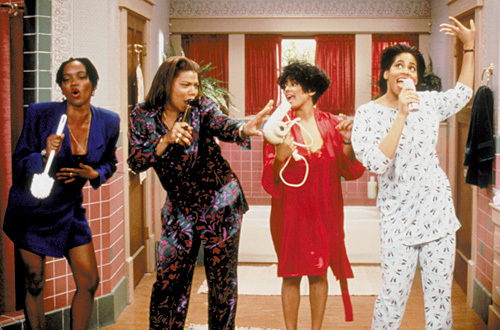 Talk about In Living Color! 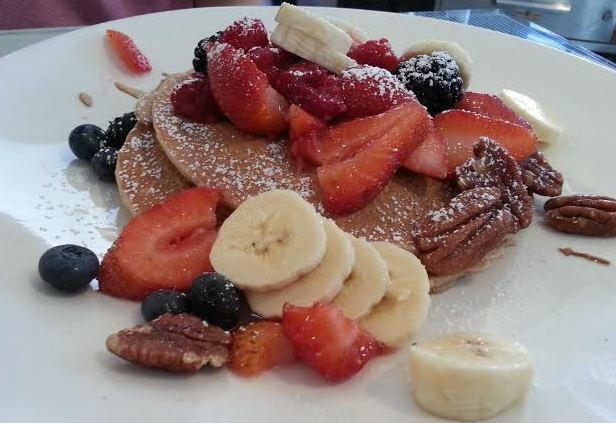 The freshness of the strawberries, blueberries, and bananas is making my mouth water all over again; throw in the pancakes, and I might start licking my laptop screen! 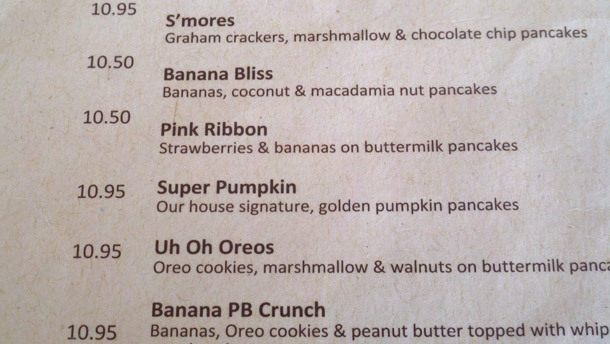 The Pink Ribbon pancakes at Bea Bea’s are everything you’d imagine them to be, and more. 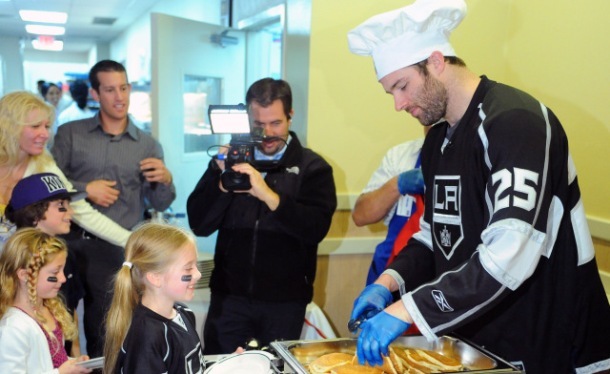 But what’s the best part about these pancakes, you ask? The fact that they don’t need a drop syrup. 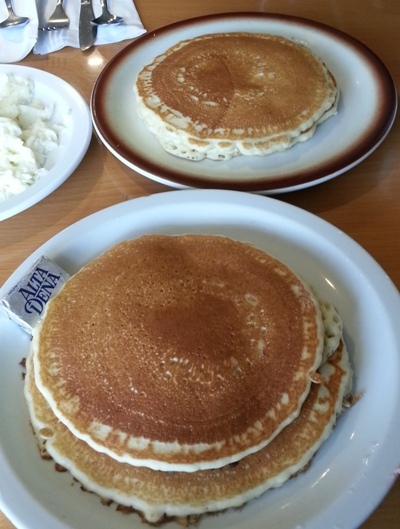 After all, Ma’amCakes’ is motto is: that a truly delicious pancake doesn’t need syrup. Kim decided to go with the Pooh’s Sunrise (which, FYI, is on the back of the menu), so that she could incorporate bacon and eggs into her meal, and also asked to switch the maple syrup for agave. Kim definitely enjoyed her food. “These are amazing,” said Kim. “And the best part is that they don’t make my tummy hurt, like typical pancakes can do.” When asking Kim which pancakes she would try next time, Kim replied “Either the Chocolate Tuxedo or the Chocolate Fantasy.” With those choices, I’d be perfectly happy to be her partner, er, pancake in crime for the next outing! Thank you so much, Kim, for being a part of Saturday brunch with Ma’amCakes! Be sure to check out Kim’s Gratitude Journal, and for those of you in the LA area, you can see Kim in her one-woman show at the Pasadena Fremont theater on February 21st and 22nd, as well as her performances at The Comedy Union. 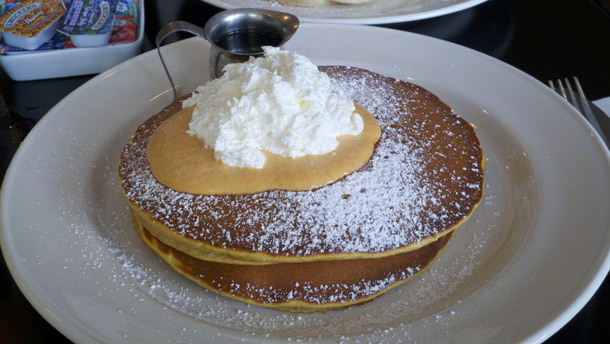 Stephen Colbert’s Views on TSA Scanner-Defying Pancakes! Well, Drew Carey Can Appreciate an Automatic Pancake Maker! Check out this video of Drew Carey’s reaction to the Automatic Pancake Maker giveaway on The Price is Right! 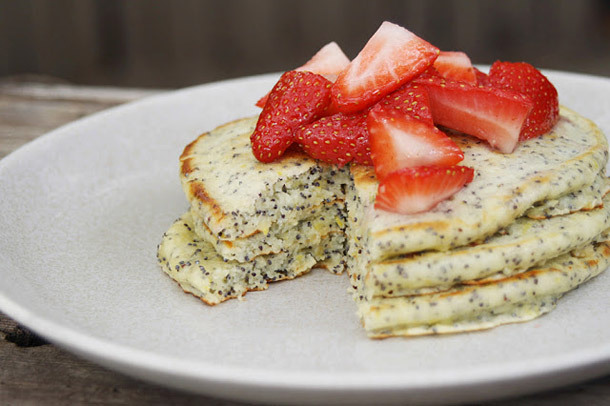 Check Out This De-Lish Lemon Poppy Seed Pancake Recipe!